Mahindra World City Jaipur, one of India’s premier integrated business cities, has become the first project in Asia to receive Stage 2 Climate Positive Development certification from the C40 Cities Climate Leadership Group (C40). The Mahindra project, which is also the largest project in the world (by population) to reach this certification, is being recognized for its Climate Positive Roadmap detailing its plans and commitment to achieve a net-negative carbon emissions outcome. The C40 Cities Climate Leadership Group, now in its 10th year, connects more than 75 of the world’s greatest cities, representing 500+ million people and one quarter of the global economy. Its Climate Positive Development Programme is a performance-based framework designed to create models for how cities can grow in low carbon ways. Stage 2 Climate Positive recognition is given to those developers who have successfully created detailed plans for how they will reduce energy, waste and transportation related carbon emissions onsite and expand the impact to the surrounding community in order to achieve a Climate Positive outcome. 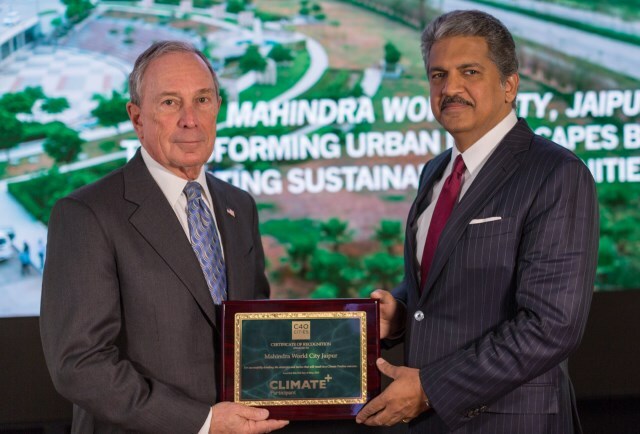 In recognition of this milestone, President of the C40 Board and UN Secretary-General’s Special Envoy for Cities and Climate Change Michael R. Bloomberg presented a commemorative plaque to Anand Mahindra, Chairman, Mahindra Group at Bloomberg LP in New York City. C40 Board President and UN Secretary-General’s Special Envoy for Cities and Climate Change Michael R. Bloomberg noted, “The partnership between the Mahindra Group and Jaipur is a great example of how cities can grow and provide opportunities for people without polluting the planet or worsening the risks we face from climate change. The Climate Positive Development Programme (CPDP) was created to meet the pressing dual challenges of rapid urbanization and climate change. Part of the C40’s Sustainable Communities Initiative, the Programme was originally developed in partnership with the Clinton Climate Initiative and the U.S Green Building Council. It aims to create large-scale models and global good-practice examples of urban development that help mitigate climate change by reducing carbon emissions in an economically sustainable manner. Pioneered by Mahindra Lifespaces, Mahindra World Cities (MWCs), are integrated business cities through developments in Chennai and Jaipur. These developments cover 1.862 hectares (4,600 acres) and house over 125 reputed global companies, providing an integrated environment for Life, Living and Livelihood.